The Serene Angel Urns Series is a collection of elegant, ivory hued angel sculptures. A light dusting of glitter gives them a delightful shine. Each angel is depicted in closed-eyed prayer, with flowing robes and feathered wings. Durable materials provide for indoor or outdoor presentation. Companion Urn measures 24" x 14"; 430 cubic inches. Large Urn measures 18" x 10"; 173 cubic inches. Medium Urn measures 12" x 8"; 21 cubic inches. Small Urn measures 9 3/4" x 7"; 11 cubic inches. This exquisite companion urn is made from solid hardwood and features a sliding top. 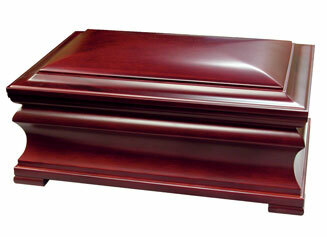 The Presidential is one of the most beautiful wood urns available today. It has a removable divider and will accomodate two. 4-line engraving maximum on top for this Urn.